A great many things can happen to a roof over the course of its lifetime. It can be subject to any number of storms and other natural events. The important thing is to know the material state of your roof well enough to tell when it is time to do maintenance, or when it is time to have the roof replaced. As a homeowner, keeping your roof in top condition is one of your top goals. If you have identified a leak or other weakness in the material state of your roof, you may be tempted to call in some friends to do the repair work yourself. Taking this path is very risky, and it can lead to more problems than it solves. 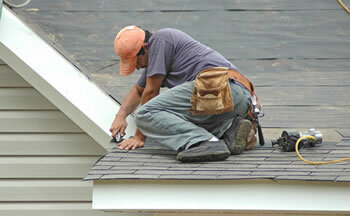 Roofing is a specialized activity. Repairing a roof requires particular tools and special knowledge, skills, and abilities in order to do it well. If you do not have the equipment or the know how to conduct a proper roof repair, then you may cause more problems than you fix, and you may even end up harming yourself or others. The best thing to do is to call a professional and well-qualified roofer to do the job. Such a person can come to your home, assess the material condition of your roof, and provide you with a repair estimate and cost in a timely and effective manner. Only the most experienced roofers can provide you with the value and world class customer service that you need and deserve. Fortunately, such roofers can be easily found. The place to begin your search is on the worldwide web. Using the web will enable you to efficiently and effectively find the roofer you need to help you with your problem. The web will allow you to carefully scan all of the options that are out there in a way that fits in with your daily schedule. You will be able to bring all of the various websites to the comfort of your computer screen, where you will be able to evaluate the quality, value, and service of each one. This will then enable you to make a decision on which one to work with. Roofing services provide you the chance to repair or replace a leaky, faulty, or permanently damaged roof. Working with a professional roofer can provide you with a great opportunity to conduct the repairs your roof needs in order to make it fully functional and put it back into top notch condition. Roofing is often something that homeowners would rather not deal with. It sometimes requires a significant investment in order to get your roof into the condition it ought to be in. However, things do not have to be so expensive for you. A roof, like most material things, can be protected and preserved if the right regular maintenance is conducted. Implementing a planned maintenance system is one of the best ways to ensure that your roof is kept together and in good condition for a long period of time. One of the things that a professional roofer can do for you is help you draw up such a plan and put it into action.